If you're looking for an attractive, peaceful addition to a community tank, the Emperor Tetra may be an ideal choice. Not only is it a handsome, irridescent species with impressive reflective rainbow hues, but it's also a peaceful and hardy addition to a mixed community of South American freshwater fish. Emperor Tetras are easy to find and relatively inexpensive. These fish are native to the freshwater Atrato and San Juan River basins of Colombia in South America. They frequent areas that are slow-moving, such as small tributaries and streams, where the temperature ranges from 23 to 27 degrees Celsius. Though the Emperor Tetra is not widely distributed in the wild, it has become a favorite aquarium pet and is farmed for sale around the world. The attractive coloration and elegant finnage of the regal Emperor tetra leaves little doubt why the Emperor Tetra was given its name. 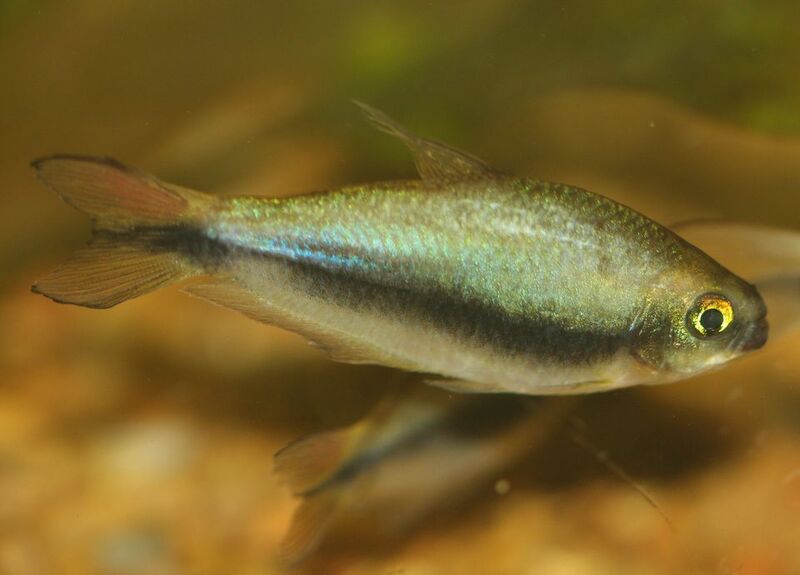 Introduced to home aquaria over forty years ago, they have become one of the more popular of the tetra family. Fins of both sexes have a yellow hue and are edged in black on the outer periphery, and red where the fin meets the body. The body of the fish is blue-gray with mauve tones and displays an almost iridescent sheen. A dark stripe runs horizontally from mouth to tail. The body is lighter in color below the stripes. A schooling fish, the Emperor Tetra does best in groups of five or six with a single "alpha male," though it can also thrive in a mating pair. It is also a peaceful species, and thus ideal for a relatively small community tank though it will be disturbed by more boisterous species. Some compatible species include Danios, Rasboras, other tetras, and peaceful catfish species such as Corydoras or smaller Loricariids. Pencil fish and dwarf cichlids are also good choices, especially as they hail from the same general region. You may want to choose species that contrast visually with the colorful Emperor Tetra to create a palette that's pleasing to the eye. Emperors favor dense vegetation and subdued lighting that mimics the Colombian rivers from which they originate. Dark substrate and a heavily planted tank will go far to make them feel at home (and provide a gorgeous backdrop to this species' brilliant colors). Although peat filtration is often recommended, they will thrive in even moderately hard water as long as it is changed frequently to maintain purity. They prefer quiet habitats, and should only be kept with other peaceful species that share similar water requirements. Schools of five or more are ideal. Undemanding regarding their diet, Emperors will readily accept flake foods, freeze-dried foods, and frozen foods. Live foods such as daphnia, mosquito larvae, and brine shrimp are especially relished and are excellent when conditioning breeding pairs. Unlike many tetra species that have a unisex appearance, male and female Emperors are easy to tell apart. The dorsal and caudal fins of the male are noticeably longer and more pointed than the female. Also quite noticeable in the male is an extended ray in the middle of the caudal fin that gives the tail the appearance of a trident. The female is smaller and plumper in the body than the male. Schools composed of approximately equal numbers of males and females will eventually yield one or more breeding pairs. Each breeding pair should have their own breeding tank, as the males become quite aggressive when spawning. Separate the male and female for a day or two, and condition with live foods prior to spawning attempts. Maintain water temperature in the breeding tank at 8 to 82 degrees Fahrenheit, and pH at 7.0. The water should be very soft. Place a spawning mop or dense floating plants in the tank, and keep the lighting subdued. The breeding tank need not be set up with a substrate or any other decorations. This will allow for ease of cleaning as the fry (baby fish) develop. Spawning begins at dawn when eggs are laid singly over a period of several hours until fifty to one hundred eggs have been produced. The parents will often consume the eggs and should be removed after spawning has taken place. A sponge filter should be used in the tank as the fry are grown out. The fry will hatch in 24-48 hours and will eat infusoria or other small foods such as freshly hatched brine shrimp. Water pH should not be allowed to become too acidic, or the developing fry may be lost as the result of digestive disturbances. Perform water changes weekly.